Check out this great apartment located in Girona, Spain. 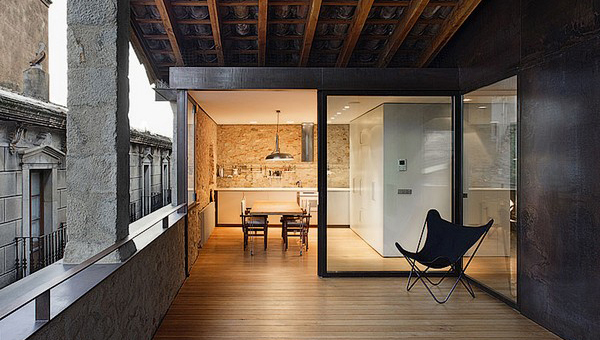 Barcelona architect Anna Noguera has converted a sixteenth-century house in Girona into two contemporary holiday apartments. “El Badiu” (The Veranda) is a 180 m2 duplex in the upper two floors equipped with a master suite and two children suites, kitchen-dining room, great living room with fireplace and a spectacular veranda terrace facing south with exclusive views over the old quarter. It sleeps up to 5 – 6 people. “El Jardí” (The Garden) is a 100 m2 apartment equipped with two double bedrooms, a spacious bathroom, a large living room with kitchenette and a nice private garden with solarium and swimming pool. It sleeps 4 – 5 people. For more info visit Anna Noguera and Welcome Beyond. Photographs by Enric Duch.